From col. F. C. Baker. THE ANHINGA OR SNAKE BIRD. HE Snake Bird is very singular indeed in appearance, and interesting as well in its habits. Tropical and sub-tropical America, north to the Carolinas and Southern Illinois, where it is a regular summer resident, are its known haunts. Here it is recognized by different names, as Water Turkey, Darter, and Snake Bird. The last mentioned seems to be the most appropriate name for it, as the shape of its head and neck at once suggest the serpent. In Florida it is called the Grecian Lady, at the mouth of the Mississippi, Water Crow, and in Louisiana, Bec a Lancette. It often swims with the body entirely under water, its head and long neck in sight like some species of water snakes, and has no doubt more than once left the impression on the mind of the superstitious sailor that he has seen a veritable sea serpent, the fear of which lead him to exaggerate the size of it. This bird so strange in looks and action is common in summer in the South Atlantic and Gulf States, frequenting the almost impenetrable swamps, and is a constant resident of Florida. As a diver the Snake Bird is the most wonderful of all the Ducks. Like the Loon it can disappear instantly and noiselessly, swim a long distance and reappear almost in an opposite direction to that in which naturally it would be supposed to go. And the ease with which, when alarmed, it will drop from its perch and leave scarcely a ripple on the surface of the water, would appear incredible in so large a bird, were it not a well known fact. It has also the curious habit of sinking like a Grebe. The nests of the Anhinga are located in various places, sometimes in low bushes at a height from the ground of only a few feet, or in the upper branches of high trees, but always over water. Though web footed, it is strong enough to grasp tightly the perch on which it nests. This gives it a great advantage over the common Duck which can nest only on the ground. Sometimes Snake Birds breed in colonies with various species of Herons. From three to five eggs, bluish, or dark greenish white, are usually found in the nest. Prof. F. C. Baker, secretary of the Chicago Academy of Sciences, to whom we are indebted for the specimen presented here, captured this bird at Micco, Brevard Co., Florida, in April, 1889. 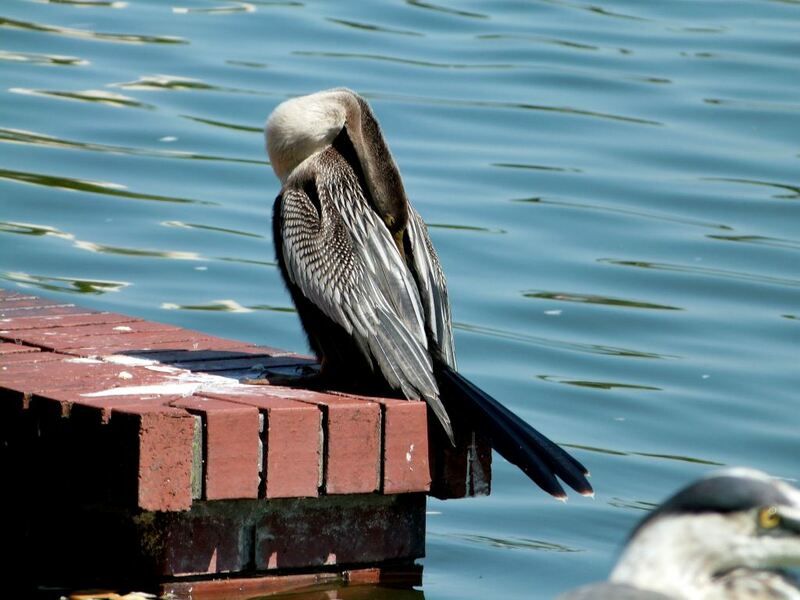 He says he found a peculiar parasite in the brain of the Anhinga. The Anhingas consist of but one species, which has a representative in the warmer parts of each of the great divisions of the earth. The number seen together varies from eight or ten to several hundred. The hair-like feathers on the neck form a sort of loose mane. When asleep the bird stands with its body almost erect. In rainy weather it often spends the greater part of the day in an erect attitude, with its neck and head stretched upward, remaining perfectly motionless, so that the water may glide off its plumage. The fluted tail is very thick and beautiful and serves as a propeller as well as a rudder in swimming. Nest—Of sticks, lined with moss, rootlets, etc., in a bush or tree over the water. Eggs—Two to four; bluish white, with a chalky deposit. Anhingas are very common here in central Florida. We see them “hanging out to dry” all the time. That, or swimming in the lake with only their neck sticking out. They do look like a snake at times. The Anhinga (Anhinga anhinga), sometimes called Snakebird, Darter, American Darter, or Water Turkey, is a water bird of the warmer parts of the Americas. The word anhinga comes from the Brazilian Tupi language and means devil bird or snake bird. It is a cormorant-like bird with an average body length of 85 cm (33 in), a wingspan of 117 cm (46 in), and a mass of up to 1.35 kg (3.0 lb). It is a dark-plumaged piscivore with a very long neck, and often swims with only the neck above water. When swimming in this style the name Snakebird is apparent, since only the colored neck appears above water the bird looks like a snake ready to strike. Most of the male Anhinga’s body is a glossy black green with the wings, base of wings, and tail being a glossy black blue. The tip of the tail has white feathers. The back of the head and the neck have elongated feathers that have been described as gray or light purple white. The upper back of the body and wings is spotted or streaked with white. The female Anhinga is similar to the male Anhinga except that it has a pale gray-buff or light brown head, neck, and upper chest. The lower chest or breast is a chestnut color and as compared to the male, the female has a more brown back. This bird is often mistaken for the Double-crested Cormorant due to its similar size and behavior. However, the two species can be differentiated by their tails and bills. 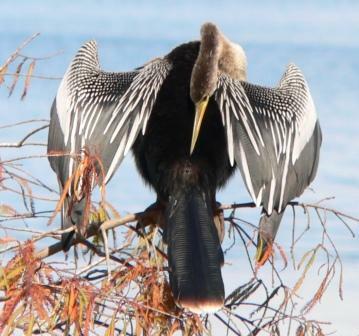 The tail of the anhinga is wider and much longer than that of the cormorant. The bill of the anhinga is pointed, while the bill of the cormorant has a hook-tip. The Anhinga is placed in the darter family, Anhingidae, and is closely related to Indian (Anhinga melanogaster), African (A. rufa), and Australian (A. novaehollandiae) Darters. The above article is an article in the monthly serial for May 1897 “designed to promote Knowledge of Bird-Live.” These include Color Photography, as they call them, today they are drawings. There are at least three Volumes that have been digitized by Project Gutenberg. 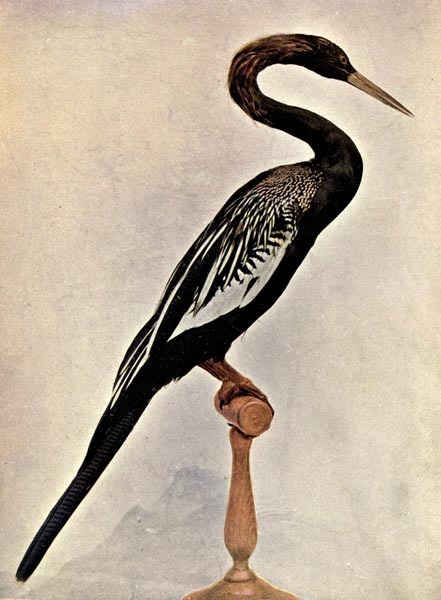 This entry was posted in Birds, Kid's Section and tagged Anhinga, Anhingidae, Birds Illustrated by Color Photography, Birdwatching, Christian, From The Past, Home School, Kids, Nature, Photography, Vol 2 #1 July 1897, Youth. Bookmark the permalink. I always enjoy seeing anhingas!